Sargent’s cherry is a small tree of rounded habit and great for multi-season interest. 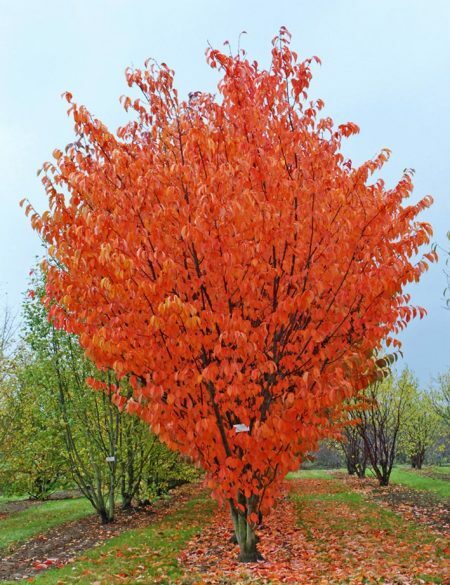 In spring it produces a cloud of brilliant rose-pink single flowers, followed by bronze-red new foliage which turns green by summer, then phases into spectacularly fiery autumn tones which complement its chestnut-brown bark. Prunus sargentii is also regularly produces some fruit: gems of glossy yellow, orange, red and purple-black. Bark is dark chestnut-brown. It grows best in moderately fertile soil in full sun.